I have two words for you—salted caramel. I know, you are probably thinking, salted caramels are -so- last year. But until you have had a scoop of this particular salted caramel ice cream at the Bi-Rite Creamery in SF, then you just haven't lived. Your whole life until this point has been an utterly meaningless, complete waste of time. Stop screwing around. This ice cream is important to your development. It is buttery, soft, and creamy with the perfect balance of sweet and salty. If they need a new name for it I suggest: A Good Reason to Live. Oh, they have other flavors, and I know they're good, because Beta Wife tries them. So I know she would want me to say something about the delicious roasted banana or the zingy ginger. But every time we go I end up with one scoop of chocolate and one scoop of salted caramel. Maybe chocolate is boring, but it's my default ice cream flavor setting. That's why I'm always stealing some of hers if I want to try something new. So maybe it's a good idea to bring someone along for the trip. 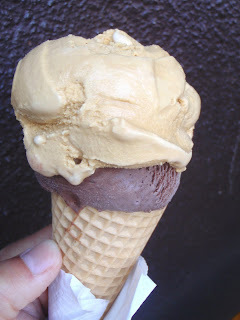 BTW--Bi-Rite ice cream is made in small batches using local, organic ingredients. Be prepared to stand in line on weekends, but know that it's well worth the wait.